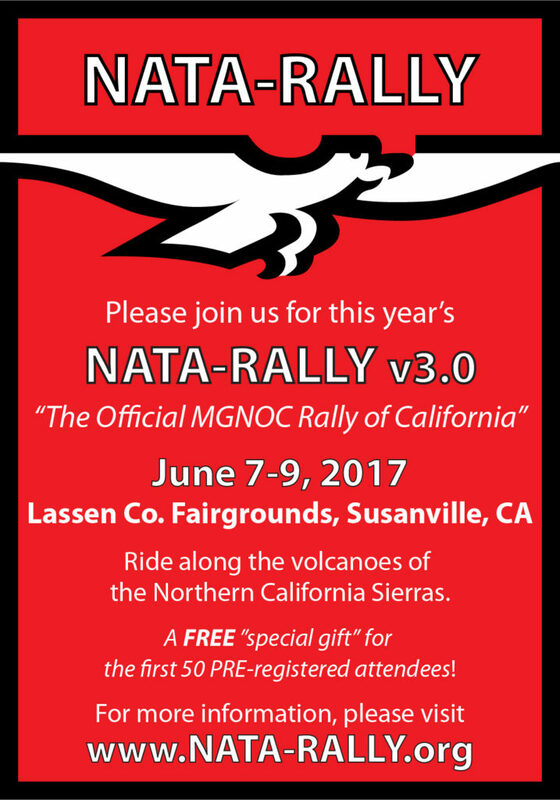 NATA-RALLY versione3.0 is at a NEW location, Lassen County Fairgrounds in Susanville CA featuring tent camping and RV camping with hook-ups AND hotels within walking distance. FREE Italian grade stainless steel commemorative tumbler. By popular demand,this year’s feature is FOOD (again). Friday night will be pasta dinner. Saturday morning, enjoy some corned beef and hash and hot coffee. Saturday night, you will be treated to “world famous” Jerry Brindle’s smoked meats. BYOVino. If you’re allergic to meat, bring a pallet of allergy pills or we can make something else, let us know. 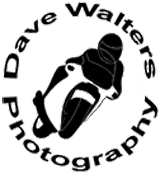 FEES are worth every penny at $60.00 per motorcycle and $120.00 for couples, that includes camping both nights with all the food, snacks and drinks. RV camping is an additional $25 per site, first come first serve. 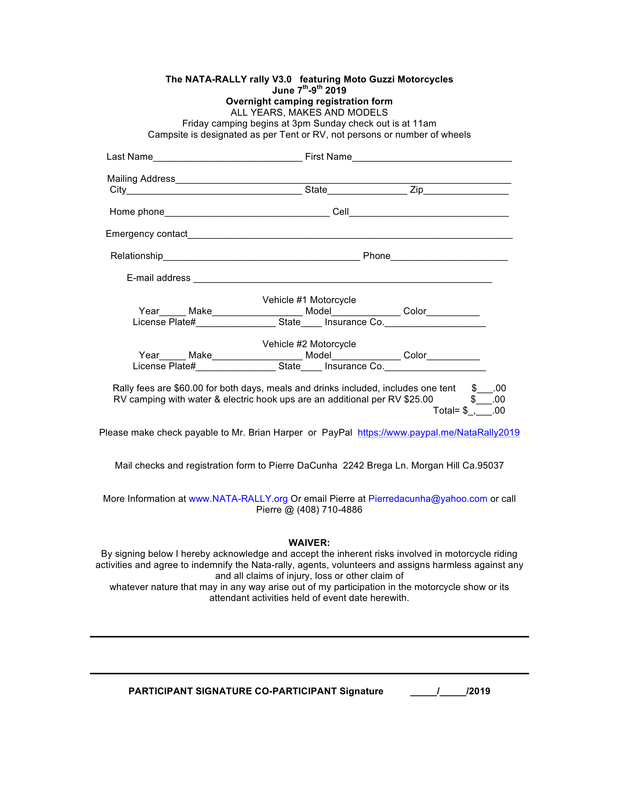 To register early by mail, please right-click and download the Registration Form below. For more info call Pierre @ (408) 710-4886. 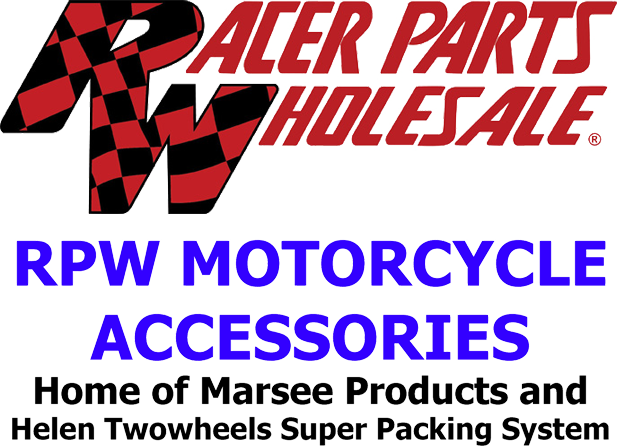 Special instructions: ALL motorcycles are welcome!!! Thanks to all the generous donations and sponsors, NATA-RALLY is providing free water, iced teas, and colas throughout the weekend. A light breakfast of pastries, oatmeal, yogurt, fruits, hot coffee, and tea are also being provided to the overnight campers on Sunday or those who come in extra early to visit. This year the NATA-RALLY is welcoming anyone to stay for dinner. All food will be made on site, with love, by our own Rally helpers. Park Rules, please follow the printed and posted park rules and please remember that we are all Ambassadors ( pun intended ) for the Moto Guzzi and motorcycling community so no speeding please and quiet time starts at 10:00 pm. Susanville sits at the Northwest base of the Sierra Mountains in the very Northern California, the average temp for that time of year is 74 degrees but layers are recommended as nights may get cold. The rally site is within three (3) minutes of the restaurants, hotels, and groceries. The NATA-RALLY is very loosely formatted, and as our previous events, please forgive us for any shortcomings. The Moto Guzzi community of the Bay Area is also holding this event to help bring together more Guzzisti and other motorcyclists and give back to the community at the same time.